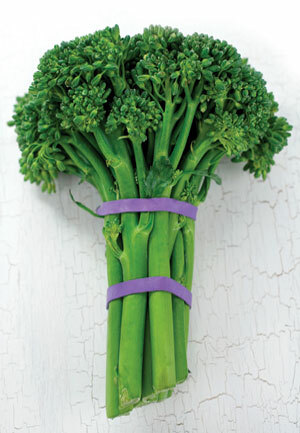 Despite what you think or may have been told broccolini is not baby broccoli. It is actually a hybrid between broccoli and gai lan, also known as Chinese chard. The unique vegetable resembles broccoli or asparagus in physical appearance, with long stalks topped by delicate buds. It has a taste that lies somewhere between broccoli and asparagus, it's sweet and tender with a little bite. One of my favorite ways to cook broccolini is to roast it with a little olive oil, seasoned with salt, pepper and garlic. It cooks pretty quickly and gets a nice nutty flavor after being roasted. The best part is that the whole plant is edible, so no need to peel the stem or trim off. Tonight's dinner is one of my favorites, stuffed baked potato and roasted broccolini. Peasant food, quick to make, inexpensive and filling. For the stuffing part of the potato, I sauteed portabella mushrooms and caramelized some onions, served it up with a little dash (or two) of A1 steak sauce. I love A1 steak sauce, it doesn't contain Worcestershire sauce so it is completely vegan. Read the ingredients, you may be surprised to see raisins lurking in there! I am not a fan of raisins on their own, but in A1 sauce they are perfect!